Each time I drive through California’s Central Valley I am in awe of how much food it produces. 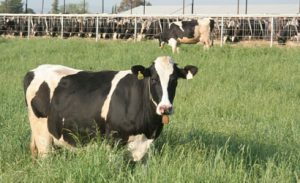 The Valley is responsible for almost 10 percent of the country’s agriculture value and is home to many of California’s most productive dairies. In fact, 90 percent of California’s milk is produced in eight counties – all located in the center of our great state. California is the country’s number-one milk producer and our dairy farmers work diligently to provide the highest quality milk for America’s families. A great many of these dairies are family run. They have been passed from one generation to the next and have become a staple of the Valley’s landscape. But along with milk, Central Valley dairy farmers are increasingly producing something they never have before – renewable energy – and are doing it using manure from cows. As I spoke with our partners who helped make this project a reality, I could not help but appreciate a genuine synergy. When we were developing the Dairy Digester Research and Development and Program that helped fund the project, we knew that sister agencies like the California Energy Commission, the Air Resources Board, and the California Public Utilities Commission as well as private partners like California Bio Energy would be integral in bringing these projects to life and having them stay operational for many years to come. It was refreshing and energizing to see dairy families working with public and private partners to create something that produces benefits for all Californians. Digesters work by capturing methane released by manure in covered lagoons. The captured methane is then broken down in a high-efficiency generator, where it produces renewable electricity. By using this system, the Lakeview Dairy Project is expected to cut methane emissions by approximately 75 percent and produce 6.7 million kWh of electricity annually – enough to power 757 homes for one year! Along with energy production, these three projects will collectively reduce an estimated 503,990 metric tons of carbon dioxide-equivalent over 10 years, which is equal to taking 107,921 passenger vehicles off the road. In total, the 24 projects supported by the DDRDP will reduce greenhouse gas emissions by 5.7 million metric tons of carbon dioxide-equivalent. The Lakeview project also serves as an excellent example of California’s innovative “hub and spoke” model for meeting our low carbon fuel standards, reducing emissions, and upgrading California’s transportation infrastructure. The concept is simple. One centrally located operation (the hub – in this case Lakeview) collects raw dairy biogas through low pressure PVC pipelines (spokes), from a group of existing dairies. The hub then serves as focal point for cleaning, conditioning and upgrading the gas to be used as fuel for transportation. Not only does this model significantly reduce construction costs and environmental impacts, but also demonstrates how cooperation and collective action helps us modernize transportation to meet our climate goals. I am particularly proud of the environmental rigor in these projects. These digesters have met the strictest water and air quality requirements by double-lining their lagoons to meet the San Joaquin Valley’s strict NOx air quality limits and ensure protection of groundwater from nitrates. These technologies also help reduce odors and reduce overall dairy operating costs. It was heartening to hear the experience of Cal Bio Energy’s management team explain their appreciation and positive experience in meeting the new requirement for community outreach. According to them, this turned into a great opportunity to understand any existing concerns, answer questions, and explain to employees, neighbors and other local community stakeholders how the project operates. Thank you Secretary Ross and CDFA for your leadership on this important program!